The world's first drug specifically designed to treat tuberculosis in children has been launched in Kenya. The new pill is a combination of three drugs used to treat tuberculosis, mixed in the right dosage, and is fruit-flavoured to appeal to children. Until now, the global TB Alliance says pills designed for adults have been split to get the dosage for children. Every year, about a million children fall ill with TB, which is the world's deadliest infectious disease. In 2014, an estimated 140,000 children died of TB, according to global figures from the World Health Organization (WHO). Kenya is the first country to roll out the new drug nationally, with more countries expected to follow over the next three years. Experts say the new treatment will be more effective because the components have been measured accurately and the pill is not bitter-tasting. At Majengo slum in Kenya's capital, Nairobi, a dark corridor leads to Helen Chebet's one-roomed home, where she lives with her family of six. The mud-walled building, reinforced with rusty iron sheets, has very few windows and the only source of natural light in the space she rents comes from a tiny transparent panel installed in the roof. Living conditions like these, crowded and with poor ventilation, are cited as contributing factors to the transmission of tuberculosis. This year, both Ms Chebet and her two youngest children were diagnosed with tuberculosis, after several failed attempts to treat for other possible infections. Her 15-month-old daughter Chepkoech was put on a six-month course of antibiotics, which required her to take six tablets a day. Ms Chebet tried to hide the drug in the toddler's food, but her strategy did not work. "One particular drug was difficult to split and dissolve in water... I had to grind it," Ms Chebet says adding that Chepkoech could only stand the bitter-tasting drugs for the first two months. The new drug dissolves easily in water, making it easier to take every day for the six-month treatment period. 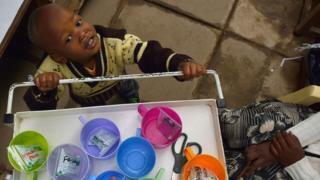 "Caregivers can easily give up knowing how difficult it is to give children such medicine," Kenya's head of TB programmes Dr Enos Masini told the BBC. It is not only Kenya, which begins rolling out the drug for free from 1 October, where TB sufferers are expected to benefit. More than 20 countries have expressed interest in introducing the pill, says Dr Cherise Scott from the TB Alliance, the global non-governmental organisation that spearheaded the production of the new drug. "The new child-friendly pill will boost survival," Dr Scott adds. Africa has the highest prevalence of TB of any continent. The global TB death rate has dropped by almost a half between 1990 and 2015, the WHO says.